This evil cannot hide from me. No matter what guise it assumes, I will be waiting for it. With an axe." 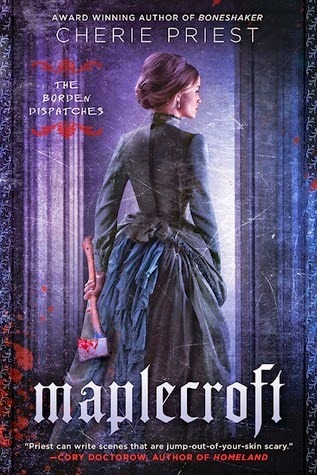 This is exactly what it sounds like: Lizzie Borden meets Lovecraft. But if you think that sounds campy or silly, you would be dead wrong. The book follows not only Lizzie, but her sister, Emma, Lizzie's lover, Nance, and a Doctor Seabury, Professor Zollicoffer and an Inspector Wolf as each of them try to make sense of the insanity that has become the town of Fall River. Lizzie and Emma were first to experience it, when their parents were inexplicably turned into monsters. Lizzie did what had to be done, but how can you make anyone believe the truth? She stood trial and was found innocent, but for years, she has been tried and found guilty in the court of public opinion, leaving her and her invalid sister virtual pariahs on the edges of town. But that is just as well, because it allows the sisters to focus on their new calling- understanding and destroying this foe. Only with great reluctance will they allow anyone else into their circle. But events are escalating, and the two women are going to have to let others in, because there is an evil coming for them that even they had never imagined. Maplecroft pulled me in immediately. It feels so Lovecraftian, and yet, it is not just a re-hashing of his ideas. It pulls from his themes, and as you follow the characters in their own discoveries, the sense of horror builds and builds. It has such a familiar feel- the blending of science and myth, the ancient evil waiting to be re-awakened... this is stuff I know and love. And yet, this is also something entirely new and refreshing. I am excited to learn that there is a second book in the Borden Dispatches, due out next year. Priest says it will be called Chapelwood, and will be set 30 years after the events of Maplecroft. Yea! I will be looking for that.